Meleen and I are so grateful to each of the sponsors for our fall getaway. Generous, creative friends who support us with sweet gifts to inspire the guests. Here's a little intro to each artist and maker. This is a great time of year to visit them online. Above is the envelope of ephemera from Michelle Geller of Hold Dear. She is a paper artist with amazing collections of pretty paper bits to decorate journals and paper arts. Visit her at holddearshop.com. Julie from Prairie Point Junction is my favorite supplier for wool felt. 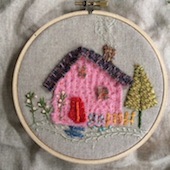 Snooping around her site, I found that she also has lots of kits and patterns for feltcraft. Fun stuff year-round but especially at holiday time! Brenda Walton sent us a ginormous box of product and pieces to craft with - especially perfect for our shadowboxes. Visit her site to see her product lines and where they are available. Love her work! And Jessica from Battenkill Pottery is right down the road from us in Vermont. She opens her studio and shop to us. We always find so much to bring home - along with the handmade pottery spoonrests she gave each guest. Hoping you put these crafty and kind folks on your list of places to visit while you are making your way down your holiday list!